Loss of sea ice could have 'catastrophic' effects on the weather in much of the northern hemisphere and speed up global warming. The Arctic Ocean could become free of sea ice for the first time in 100,000 years even if action is taken to keep global warming to within two degrees Celsius, scientists have warned. The region has experienced much sharper rises in temperature in recent decades that the rest of the world with temperatures in winter in Spitsbergen an astonishing 8 to 11C higher than the average between 1961 and 1990. And this is believed to be having a significant effect on the weather in much of the northern hemisphere, increasing the number of dangerous storms. One leading expert has warned it could have a “catastrophic” effect on the Earth’s climate. The loss of sea ice, which reflects much of the energy from sunlight, will also increase the rate of global warming. In a paper in the journal Nature Climate Change, Dr James Screen and Dr Daniel Williamson, of Exeter University, looked at the likelihood of the ice disappearing almost completely if temperatures rose by 1.5C or 2C. The Paris Agreement on climate change spoke of keeping global warming below 2C and as close to 1.5C as possible – in order to avoid levels considered particularly dangerous – but the world is currently on track to hit anything from 2.6C to 3.1C by the end of the century. The researchers wrote: “We estimate there is less than a one-in-100,000 chance of an ice-free Arctic if global warming stays below 1.5C, and around a one-in-three chance if global warming is limited to 2C. “We suppose then that a summer ice-free Arctic is virtually certain to be avoided if the 1.5C target of the Paris Agreement is met. 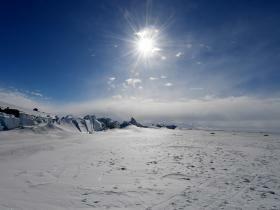 The Arctic will be considered ice-free if it falls to below a million square kilometres. This would mean the sea around the North Pole would be clear with the remaining ice found mainly in the small islands and inlets off the north coasts of Russia and Canada, where the effect of the land, which gets colder than the sea, is more pronounced. In September last year, Arctic sea ice fell to about 4.1 million square kilometres, the second lowest figure, compared to about 3.4 million in 2012, according to the US National Snow & Ice Data Centre. Antarctic sea ice is currently at record low levels with 2.14 million square kilometres, compared to the average of 3.16 million between 1981 and 2010. In December, the US National Oceanic and Atmospheric Administration (NOAA) said the situation was changing so quickly it was “outpacing our ability to understand and explain” what was happening. They suggested the word “glacial” should not be used to mean something happening slowly but as a term for something that was “rapidly diminishing”.